I changed energy supplier from British Gas to Bulb. Given that my son now has an electric car, this seemed a responsible thing to do so as to be buying 100% renewable energy, and actually Bulb were a tad cheaper. I got the final bill from British Gas, paid it, and then started paying Bulb. All pretty seamless (apart from the smart meter now being dumb). I did not expect to hear any more from British Gas, obviously. In fact, the final bill had actual smart meter readings for the date I left them, so not doubt whatsoever that I had paid correctly up to the reading on that day, no estimates. 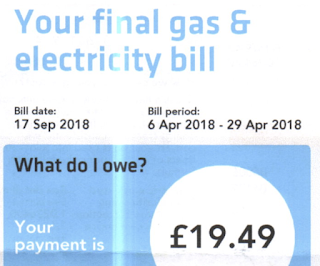 To my surprise, nearly 5 months later, I get another "final" bill from British Gas! Yes, it covers a different, longer, overlapping period. But strangely the bill is now for an estimated final reading? There is nothing on this bill saying it is a replacement of the previous bill (or bills), and no formal VAT credit note received. Indeed it lists charges for gas and electricity totalling £384.36, but showing balance and previous payments making only £19.49 due. Unsurprisingly, even I was confused, especially at the electricity charge being based on an estimated final reading not an actual one. I thought smart meters meant an end to estimated readings, and indeed the previous "final bill" made that clear. What ensued was a long, and very frustrating, conversation with British Gas, I can't be arsed to publish the recording as it is very repetitive to be honest. This blog is mind numbing enough without it. Sadly I had someone that refused to actually answer questions most of the time, or even acknowledge the point I was making, constantly saying things like "you have mentioned that before" rather than agreeing, or even disagreeing, with what I was saying. He "explained" that I have a new bill because my new energy supplier contacted them to "correct" the final electricity meter reading from 51361 to 51485, and that is why the £19.49 was due. He explained this was a replacement of my last bill and that the gas reading had not changed, which makes the bill even more confusing, but OK. I have no idea why Bulb would have contacted British Gas to make such a change. I explained that British Gas have smart meters. That the previous final bill had a smart meter reading of 51361. He confirmed smart meters are meant to be "100% accurate", and after much going round in circles he agreed that the new supplier "must have sent incorrect information". Well, from my point of view that is the end of the matter: I have paid British Gas fully up to the "100% accurate" smart meter reading for the day I left them, done. This new "final" bill is based on incorrect information - information British Gas know for a fact (based on their "100% accurate" smart meter reading) is incorrect. So I don't need to pay it, do I? He really got annoying with the "you mentioned that before" replies - so much so that at one point I said "Yes, I have, but is what I am saying incorrect?" which he refused to answer. He also got annoying with the repeated "I just need to explain why you have this bill" and I kept saying "You explained, it was new supplier sending you incorrect information, but as you know it is incorrect I don't have to pay it". He eventually said I could not just ignore the bill and that I would have to contact the new supplier - why?!?! How is that my job? No matter how many times I explained that the final meter reading is a matter of fact, one that they have absolute proof to confirm (smart meter reading), and that I have paid all usage up to that 100% accurate" final smart meter reading on the day I left so could not possibly owe any more, he would have none of it. He just kept trying to "explain" why I have this new "final" bill! We did have one slight digression which really made no sense: He said that even though the first final bill said "smart meter reading" the 51361 shown was actually what Bulb had told them. Obviously saying it is a "smart meter reading" is a tad misleading if it is not so (fraudulent maybe?). I asked him what the actual smart meter reading was and he (eventually) confirmed it was in fact 51361. So basically Bulb had confirmed the same meter reading that British Gas had actually taken - even more proof that this matter of fact was correctly recorded the first time (by both energy suppliers). We were going round in circles so I finally resorted to stating that as they knew the factually correct meter reading, they know that what they have on record now is wrong. It is wrong personal information and so I formally requested that they correct the incorrect personal information they hold on me as required by GDPR and the Data Protection Act. I had to insist on this many times. I had to ask if he would be correcting the data many times, and insist on a "yes" or "no" answer before finally getting a "no"! I then tried to get him to answer as to whether he understood that correcting incorrect personal information was a legal requirement. He refused to give a "yes" or "no" answer and finally went to talk to someone and came back saying he would credit the bill and nothing is owed. No acceptance that they had the correct final meter readings as a matter of fact. No acceptance they have any obligation to correct incorrect personal information. Oh, well, at least it is sorted, but just really annoying conversation to have. Anyway I ends by saying I was making a Subject Access Request and required all data including all smart meter readings ever. Apparently I'll had that in 7 days, nice! It should be interesting. Anyway, having sorted all of this I checked my Bulb bills. I pay them a fixed monthly amount by Direct Debit, so had not actually checked the detailed bills. But this seemed like a good time to do it. My first 3 Bulb statements charged £0.00 for electricity usage, estimated meter readings 46791 to 46791, and then a bill for £1,496.61 for 46791 to 59129 (my reading). Well, apart from a very strange way of doing estimates, that initial meter reading of 46791 is rather at odds with the final meter reading of 51361 up to which I had paid British Gas, and it does not even match the 51485 that British Gas claimed Bulb has sent them as a "correction". We'll see how well Bulb sort that one out tomorrow when they are open. Seriously, how is something so stunningly simple handled so badly by two different energy suppliers. Crazy! P.S. Sorry, before someone says this - yes, he could have said something like "There needs to be an agreed handover reading which may not be the same as the smart meter reading because of time of day or it being taken a day before or after, etc, but the bill is based on the agreed handover reading which both energy suppliers used as the reference to stop and start billing". He did not say that. Had he said that it would have made more sense except for Bulb working on such a completely different starting reading. Also, assuming that is the case, it would be better for the bill to say "agreed handover reading" rather than either "smart meter reading" or "estimated reading". They also need to not simply "replace" two previous bills with no explanation whatsoever. Since energy companies are generally untrustworthy, a sensible precaution is to take photographs of the meters on the changeover dates. That removes any uncertainty about what the final meter reading rely was. Oh, I agree, and I almost certainly have one... /me checks. Oooh, it says 51485, LOL. But that was taken 8:30am on 30th, the day after I left British Gas. What seems at odds is how there can be any doubt over a smart meter reading taken on the handover day. What? They pay their staff by cheque still? Or are they lying I wonder? Ha! Don't get me started on utility companies and their incompetent customer service departments. First Utility recently tried (twice) to take over my gas supply. They were meant to be doing it for a near neighbour, who has a similar but not identical address. They had been a bit careless in looking him up on the national gas database, and picked my entry instead of his. The first time they were reasonably sensible about it. They're one of those organisations who put as many obstacles as they can in the way of having to deal with the general public, so it took 20 mins on their web site, followed by an hour on the phone, but eventually I got to speak to someone who seemed to understand the problem and undertook to stop it. Then a month later they tried again! Despite knowing it was the wrong entry they tried again to take over my gas supply. This time around it got really insane. I could not get them off script. Despite me explaining it very clearly to them, they couldn't get beyond asking me to prove I was my neighbour. I wish I had the RevK's persistence and knowledge. As it was I wasted days and days dealing with the idiots, and not even an apology out of them. I suppose one option (if you don't care about a minor blip on credit score, which is an issue), is a single recorded delivery letter to their head office. And they then go ahead with the move and you ignore all bills. Better still, the bills go to neighbour? When, eventually, it goes to court you simply say "prove I asked you to take over the supply", and "oh, and here is a copy of the recorded delivery letter explaining I did not make any such request, which you ignored". Any sane judge throws out. Worst that can happen is old supply reinstated and correct (back dated) bills need paying. What is not publicly revealed is that when you change suppliers the old supplier supplies their version of the final meter reading to an anonymous body who then "estimate" what should be the meter readings and give them to the new supplier. Hence all this confusion with meter readings. As I understand there is apparently no direct connection between the old and new suppliers to pass over readings. Yep - that's the problem I've had (and, by looks of things, quite a few other Bulb customers: I never even knew about the 'middleman' until the Bulb forums). Sent closing read to old supplier, sent identical opening read to Bulb but 'middleman' decided it wasn't 'in line' with their estimates and changed it (as it didn't match what, based on the old suppliers figures, they estimated - problem is, old supplier wouldn't let me supply meter readings hence why I left!). I wish the anonymous company a) could be 'named and shamed' and b) their complaints procedure automatically provided to any customer who mentions to their supplier 'this reading doesn't match'. Utility suppliers seem to do their level best to make what should be a very simple exercise into the most confusing imaginable. I had a 2 year battle with nPower, who made repeated cockups. I ended up with an enormous stack of bills (~100 pages worth) with overlapping dates, never making it clear whether they were entirely replacing a previous bill (and if so which bill they were replacing), replacing part of a previous bill or in addition to a previous bill. I couldn't open a complaint because their complaints department wouldn't respond to any emails or letters and when I refused to pay the obviously incorrect bill they passed my details on to a debt collection agency because they said I was obviously at fault since I hadn't opened a complaint (despite me having repeatedly tried to contact their complaints department to do exactly that). The whole time they basically admitted that they had cocked up but insisted that this was entirely my fault because I hadn't immediately noticed that they had cocked up on every occasion. In the end the ombudsman ordered them to pay me a few hundred pounds of compensation, which they agreed to do and then failed to actually pay me. Eventually I did get the compensation and then about a year later I got another few hundred quid of compensation after the regulator ruled that the "one off and entirely my fault" cockups had happened to most of nPower's customers and ordered them to pay compensation across the board. Another problem with utilities seems to be that they use two, seemingly completely independent estimates. Firstly they do estimated meter readings based on your usage, but then they also do a separate estimate of how much you should pay each month. There seems to be very little linking these estimates and it leads to some utterly bonkers results. For example, the water company (Dŵr Cymru) keep sending me bills that tell me I'm massively in debt because they haven't been charging me big enough direct debits, but at the same time that they aren't going to be increasing the monthly direct debit because they estimate that its fine in the long term. This debt has been gradually building up for about 3 years and currently stands at about £700 I think, so clearly my DD payments aren't fine in the long term... I've not bothered to correct them because the way I figure it, if they aren't asking me to repay I may as well just bank the interest on that cash myself until they do! Sounds like a very similar story to the one I had when switching from npower to sainsburys, then when i went from BG to another supplier (cant remember who now), not only did BG cancel and reissue all of my old bills, so did npower, from 3 years previous!!?!?! To be fair, there's also tidal/wave power - the sea doesn't stop at night. And hydroelectric allows for (limited) storage when there is overproduction of wind/solar relative to demand. There isn't actually enough renewable capacity in the UK to supply all the customers that are on renewable tariffs. That is, however, slightly, missing the point. At present there is a mix of generation. Someone on a 100% renewable tariff is paying for renewable generation. So yes, even if there is a point in the day where there is not enough, it balances out with periods where more renewable is being fed in to the grid than paid for at that moment, clearly. Obviously when all generation is renewable, and with some of that varying over the day, there will need to be more capacity storage on the grid to allow for that. Well Rev, forgive me for being a cynic but I don't think we'll ever get to 100% renewable generation. Not even close. Not so much because we couldn't build for the demand, though that would be exceedingly expensive and make a nonsense of environmental regulations. No, we can't provide enough storage capacity to store for foreseeable disconnects between supply and demand. Battery tech is nowhere close despite decades of inquiry, there aren't enough Dinorwig-style pumped storage sites. Nuclear would work well, as the French have proved, but the politics don't work here, or at least governments have been pusillanimous in facing down opponents. Indeed, nuclear seems the obvious stop gap for this. But bear in mind, storage could be local "power walls" and the like, and some generation can be local "solar panels on roof". A new model for power generation, storage and distribution is probably possible in the long term. Just to add fire to the argument over how bad renewables are, it's not just the fact you don't have the capacity or storage, but the rate of change they can have. Last week during storm Ali, we had about 10GW of wind generation, meeting about a third of UK demand. When the wind died off, within hours this was just 2GW of generation, down to less than 7% and within a couple of days this was down to <100MW, not even a half of a percent. No amount of batteries or spinning reserve.or oh per.storage can cope with that. Short term blips yes, but not big losses for long periods. Future energy generation will have to be met with a range of sources, not just renewables, and will have to include nuclear and gas, though the latter can be 'decarbonised'. Personal opinion but I think rather than large coal plants like eggborough and ferry bridge (to name but a few) being shut down due to being over their LCPD hours, they should be help for them to follow the Dead model and convert to biomass.